Political parties in Pakistan who have alleged that the July 25 vote was rigged have complained that they were not given this crucial document. What is it? Hours after polls closed in Pakistan Wednesday, political parties complained that their agents were not being given Form 45. PML (N) leader Shahbaz Sharif tweeted that his party “wholly rejects the results due to manifest & massive irregularities. Form 45 was not given to our agents, results were stopped & votes were counted in the absence of our poll agents. This is both unbearable & unacceptable!… ECP [Election Commission of Pakistan] should give strict instructions for issuance of the Form 45”. What is this form? Unlike in India, counting in Pakistan begins immediately after voting ends, at the same location where votes have been cast. Form 45, earlier known as Form 14, is the official statement of the result at a particular polling station. It gives the number of valid votes received by each candidate, the number of invalid ballots, as well as disaggregated data on male and female voters for the booth. The document is signed by the presiding officer and his assistant, an accredited observer, and polling agents of the candidates. The presiding officer signs and thumb-marks copies of the form, and hands them over to candidates or agents. The presiding officer also uploads an image of the form on to the Results Transmission System, an Android app that allows the results to be sent to the ECP and the returning officer without loss of time. All presiding officers have the app on their smartphones. After the image of the Form 45 has been uploaded, the physical documents follow. Pakistan’s Election Rules require that results at each booth are provided in Form 45. On Wednesday, however, it was alleged that at several places, information was provided on plain paper, rather than in the official Form 45. It was also alleged that presiding officers had signed blank Form 45s, thus leaving scope for results to be changed before their final announcement. 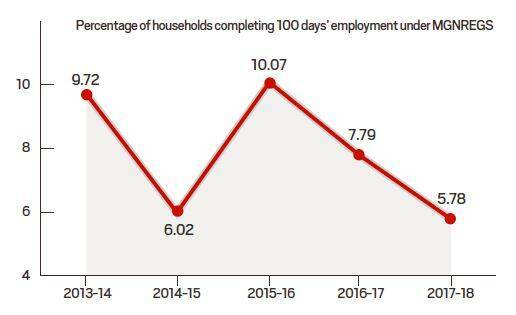 The percentage of total households that were able to get 100 days’ work in a year under the Mahatma Gandhi National Rural Employment Guarantee Scheme fell in 2017-18, according to a statement laid on the table of Lok Sabha Thursday. 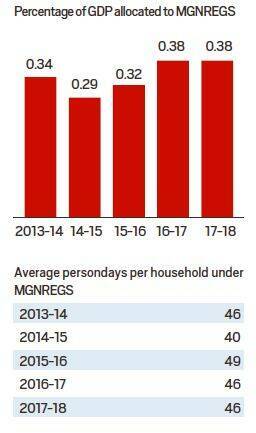 The percentage of gross domestic product (GDP) allocated to the MGNREGS has remained constant during the last two financial years, after having been raised from 0.32% in 2015-16, said the statement by Rural Development Minister Narendra Singh Tomar. MGNREGA was enacted in 2005 “for the enhancement of livelihood security of the households in rural areas of the country by providing at least one hundred days of guaranteed wage employment in every financial year to every household whose adult members volunteer to do unskilled manual work”.